This name uses Spanish naming customs: the first or paternal family name is Moratinos and the second or maternal family name is Cuyaubé. Miguel Ángel Moratinos Cuyaubé (born 8 June 1951 in Madrid) is a Spanish diplomat and politician, a member of the Socialist Workers' Party and member of Congress, where he represents Córdoba. Working with Javier Solana, who was then Spanish foreign minister, Moratinos helped prepare the Euro-Mediterranean dialogue launched in November 1995 in Barcelona. 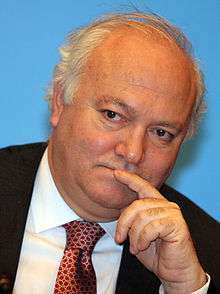 Between 1996 and 2003, Moratinos was the European Union Special Representative for the Middle East Peace Process, based in Cyprus and Brussels. In this capacity, he attended most meetings of EU foreign ministers. During his time in office, the European Union – which had already been the biggest financial contributor to the region – also became increasingly vocal about Israeli-Palestinian relations. Moratinos served as Minister of Foreign Affairs in the Government of José Luis Rodríguez Zapatero from 18 April 2004 until 21 October 2010, when he was replaced by Trinidad Jimenez. By the end of 2009, Moratinos was mentioned by news media as a potential candidate for the position of High Representative of the Union for Foreign Affairs and Security Policy; the post later went to Catherine Ashton instead. In September 2006, Moratinos joined UK Minister for Europe Geoff Hoon and Gibraltar's Chief Minister Peter Caruana in signing the Cordoba Agreement, an agreement to establish a Tripartite forum for co-operation on Gibraltar. As part of the agreement, he attended talks in Gibraltar in July 2009, making him the first Spanish minister to ever make an official visit to the British Overseas Territory. In September 2006, Moratinos became the first government official to appear before the European Parliament’s committee investigating CIA activity in Europe. In 2009, Moratinos sent a confidential note to U.S. Secretary of State Hillary Clinton warning that Spanish public opinion could turn anti-American if Spain disclosed a study on contamination caused by the 1966 Palomares B-52 crash, according to a note contained in the WikiLeaks documents and published at the time by the newspaper El País. In 2010, Moratinos announced that Spain was willing to take in five inmates from the American military prison in Guantánamo Bay, Cuba. In his capacity as minister, Moratinos was the Chairman-in-Office of the Organization for Security and Co-operation in Europe (OSCE) in 2007. On 17 August 2007, he appointed Croatian diplomat and ex-minister Miomir Žužul, "to be his personal representative in a mission to Georgia on (a) missile incident that took place on 6 August," alleged to be a Russian missile strike on Georgian territory. Following the Bolivian general election in December 2005, Moratinos summoned the Vatican's envoy to Spain after a comedian for conservative radio station Cadena COPE held a five-minute telephone conversation with the newly elected president of Bolivia, Evo Morales, while claiming to be the Spanish prime minister. In October 2006, Moratinos announced that EADS CASA, a division of the European defense company EADS, had decided to cancel a deal on selling 12 military transport planes to Venezuela because American government objections made it unfeasible. In 2007, U.S. Secretary of State Condoleezza Rice criticized Spain for not doing more to support dissidents in communist Cuba, after Morationos chose not to meet with Cuban dissidents during a visit to the United States in April 2007. In 2010, he took part in the tripartite negotiations with Cuban President Raúl Castro and Roman Catholic bishop Jaime Ortega that resulted in pardons being granted to 52 Black Spring prisoners on the condition that they go into exile in Spain. In late 2009, Moratinos was at the forefront of efforts to reinstate ousted President Manuel Zelaya of Honduras. In 2010, Moratinos was given a new mission as a special envoy trying to defuse a row between Israel and Egypt that threatened to derail, for the second time, a summit of the Union for the Mediterranean. Since 2011, Moratinos has been teaching at Sciences Po Paris. Also in 2011, he was nominated by the Spanish government as a candidate for the position of director general of FAO; as part of his election campaign, he visited 90 countries. However, on June 26 he lost to Brazilian José Graziano da Silva. He received 88 votes out of 180 cast in the second round, while Graziano da Silva won 92. In mid-2012, Moratinos was among the candidates at the United Nations for a possible replacement of Kofi Annan as UN-Arab League Joint Special Envoy for Syria. From 2012 to 2013, Moratinos was a member of the High-Level Advisory Council of the President of the 67th Session of the United Nations General Assembly, Serbia's then foreign minister Vuk Jeremić. ↑ Troubleshooter for peace European Voice, June 7, 2000. ↑ EU strives to keep Middle East peace talks alive European Voice, February 3, 1999. ↑ Mark Turner (July 16, 1997 Israel under fire on peace commitment European Voice. ↑ Stephen Castle (November 17, 2009), Blair’s Chances for Europe Presidency Said to Fade International Herald Tribune. ↑ "Historic deal agreed on Gibraltar". BBC. 18 September 2006. Retrieved 2011-02-04. ↑ "Spain in rare talks on Gibraltar". BBC. 21 July 2009. Retrieved 2011-02-04. ↑ Judith Crosbie (September 6, 2006), Moratinos to appear before ‘CIA’ committee European Voice. ↑ Raphael Minder (June 20, 2016), Even Without Detonation, 4 Hydrogen Bombs From ’66 Scar Spanish Village New York Times. ↑ Spain Agrees to Accept 5 Guantánamo Inmates New York Times, February 15, 2010. ↑ OSCE Chairman appoints personal representative for mission to Georgia on missile incident. The OSCE Press release. 17 August 2007. ↑ OSCE Appoints Envoy To Probe Georgia Missile. Defensenews.com. 17 August 2007. ↑ Renwick McLean (December 23, 2005), Official Call to New Leader of Bolivia Is Spanish Hoax New York Times. ↑ Renwick McLean (October 19, 2006), U.S. Objections Lead Spain to End Venezuela Deal New York Times. ↑ Raphael Minder (June 1, 2012), Exiled Cubans Living in Spain Feel Abandoned as Benefits Dry Up New York Times. ↑ Nicholas Casey and David Luhnow (December 2, 2009), Honduran Election Gains Backing Wall Street Journal. ↑ Defeated again European Voice, November 17, 2010. ↑ "Candidates for the post of Director-General announced". FAO. Retrieved 9 September 2012. ↑ Raphael Minder (June 24, 2011), Amid Criticism, U.N. Food Agency to Elect Chief International Herald Tribune. ↑ "José Graziano da Silva of Brazil elected FAO Director-General". FAO. Retrieved 9 September 2012. ↑ Louis Charbonneau (August 8, 2012), Doubts arise about replacing Annan as Syria war worsens Reuters. ↑ Associate Fellow: Miguel Ángel Moratinos Cuyaubé Geneva Centre for Security Policy (GCSP). ↑ International Advisory Board Bahrain Center for Strategic, International and Energy Studies (DERASAT), Manama. ↑ Board of Trustees British University in Egypt, Cairo. ↑ Board of Advisors Center for International Relations and Sustainable Development (CIRSD), Belgrade. ↑ About the foundation Fundación Onuart, Barcelona. ↑ Governance Institut de Prospective Economique du Monde Méditerranéen (IPEMED), Paris. ↑ Alejandra Agudo (November 30, 2015), Spanish politicians hash out sustainability goals EurActiv. ↑ "Spanish FM named honorary Belgrade citizen". B92, Beta, Tanjug. Belgrade, Serbia: B92. 13 December 2009. Retrieved 13 December 2009. Wikimedia Commons has media related to Miguel Ángel Moratinos.